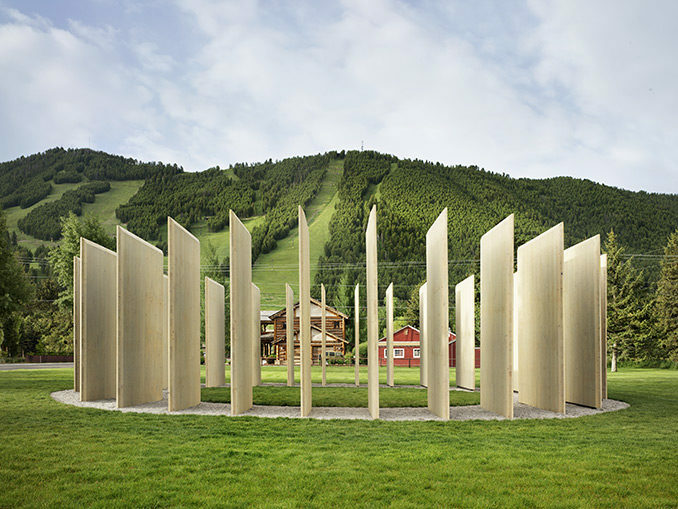 Carney Logan Burke Architects’ new temporary public art sculpture Town Enclosure officially opened on June 27, 2018 in The Center Park Jackson, WY. 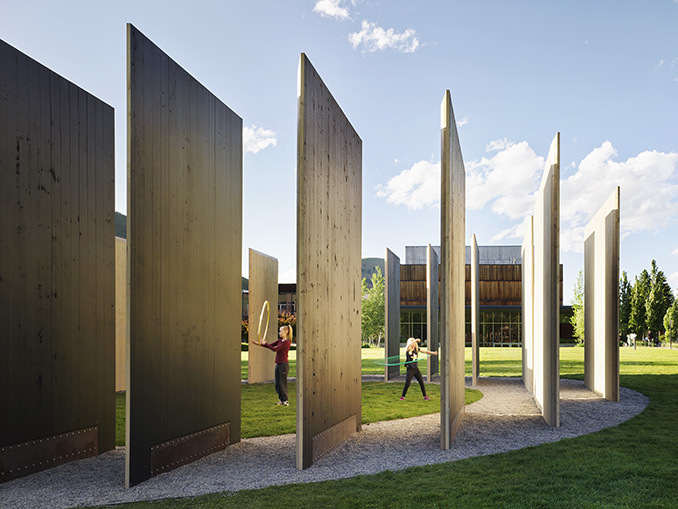 Commissioned by Jackson Hole Public Art and Center for the Arts’ 2018 Creative in Residence program, this was the winner of a competition to design the 2018 Pavilion Project. Town Enclosure is both a sculpture and an accessible gathering space, welcoming a diverse range of both informal and programmed performing and visual arts events. 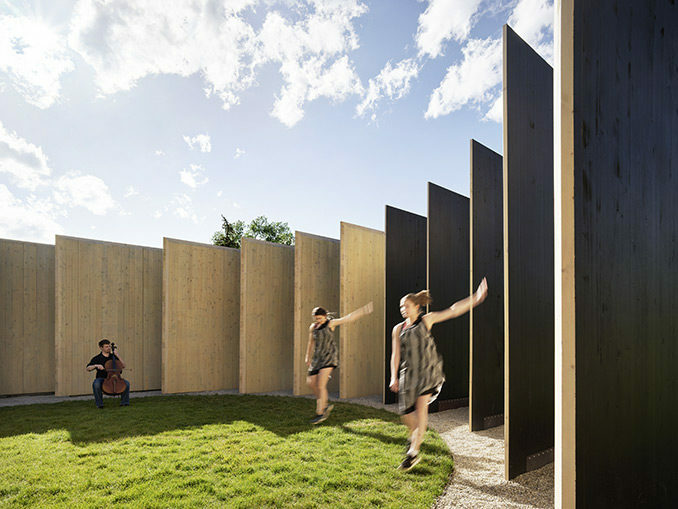 The visually powerful design is elegant in its simplicity, consisting of a circle of timber panels, sourced from sustainably managed forests. Angled inwards and evenly spaced four feet apart, one side of each is painted in black. This creates a space that is simultaneously open and closed, changing according to the viewer’s position. From Cache Street and Hansen Avenue, it appears mostly opaque, but from the Center and Snow King Mountain it is nearly transparent. Each plane also creates shadows, which change during the day. The fluidity of this design encourages movement around and through the structure so that viewers gain the full experience. Carney Logan Burke Architects was inspired by the local environment, referencing fences and corrals from the mountain west region. The structure has a limited material footprint, demonstrating their commitment to sustainability. 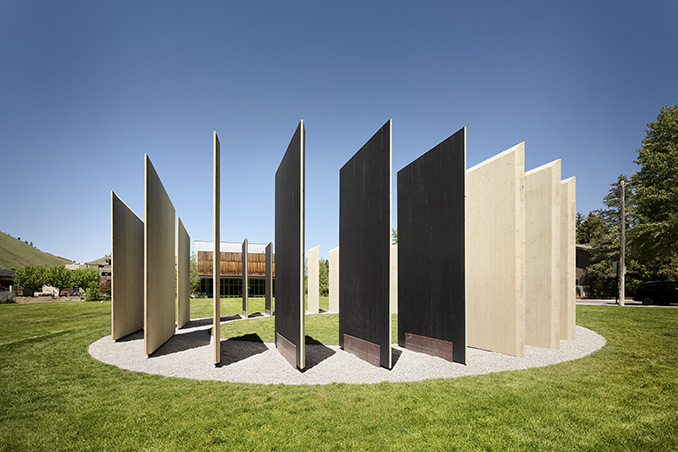 The foundation is made of re-usable steel covered by a circular gravel field, using no concrete at all. When Town Enclosure is removed from the park, only a small quantity of sod will be required for restoration. “Town Enclosure is much more than a sculpture”, explains Eric Logan, Principal of Carney Logan Burke Architects. “It is an armature for celebration of creative activity, performance, and discovery, a backdrop for the various activities this community park supports. Town Enclosure is a temporary project, installed for one year, with the intention of drawing people into the park and providing a platform for creative expression. It will serve as a venue for both the creative community and the public, welcoming an array of performing and visual arts, exhibitions, and classes. Residents of The Center for the Arts, non-profits, and community groups are encouraged to propose events and experiences, giving them a unique opportunity to experiment with and test out free, accessible, gateway arts experiences with the public. “This competition was only open to local artists and architects, an opportunity to highlight the talented pool of creative professionals working in Jackson. 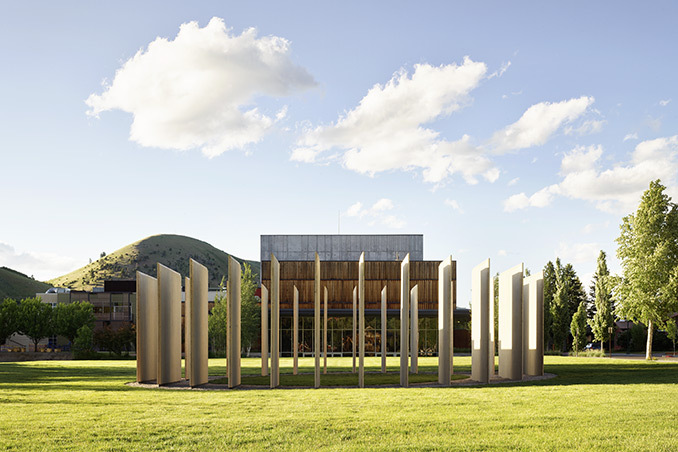 The selection panel chose Carney Logan Burke Architects’ submission as a sculptural form and for its ability to serve as an inspiring setting to make, practice and perform a variety of art forms,” said Carrie Geraci, Jackson Hole Public Art Director. “We hope that Town Enclosure will help grow future arts audiences and raise the visibility of the vibrant art making that takes place within the community”.